Fay Lansner (1921 – 2010) was an American painter known for her abstract expressionist and figurative paintings and her strong use of color. 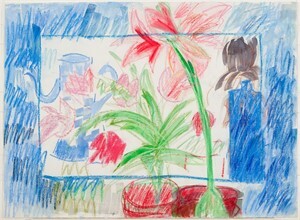 Lansner’s work evolved from her geometric abstract pastel and charcoal drawings of the late 1940’s when she was a student of Hans Hoffman, through a series of expressionist figurative paintings in the 1950’s and 1960’s, to her large bold portraits and still-life drawings in the 1990’s. Her work was the subject of thirty solo shows from 1951-2009, and she was included in over one hundred group exhibitions in the United States and Paris throughout her career. Lansner was born in Philadelphia, the daughter of Russian émigré parents. In 1945, she attended The Tyler School of Fine Arts at Temple University, but longing to be part of the “real” art world, she moved to New York City in 1947 to attend Columbia University and the Arts Students League. At Columbia, she studied with the illustrious art theorist Susanne Langer, who shared ground-breaking work on symbolism with her students, and at the Arts Students League she studied drawing with Vaclav Vytlacil. She also attended Hans Hofmann’s popular drawing class in Provincetown, Massachusetts in the summer of 1948 and continued to study with him in 1949 in New York City with fellow students Jan Muller, Wolf Kahn, Larry Rivers, and Grace Hartigan. During these early years, Fay married Kermit Lansner, and in 1950, the two moved to Paris, where Kermit had received a Fulbright Fellowship to study the philosopher Merleau-Ponty, while Fay embraced the chance to see the origins of modernism first hand. While living in Paris, she studied with Fernand Leger and then with Andre Lhote, and had her first solo exhibition of monochromatic lithographs at the Galerie Huit. 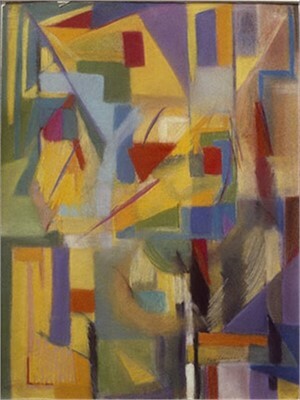 Upon her return to New York in 1951, Lansner was thrust into the Abstract Expressionist movement. Armed with her exposure to European art history and Hofmann’s lessons, she quickly became affiliated with her American peers, including Willem de Kooning, Joan Mitchell, and Franz Kline. She was briefly a member of the Artist’s Club but felt relegated by the founding male members. Soon she joined the Hansa Gallery, one of the first cooperative galleries that had begun to proliferate in downtown New York, and had her first American exhibition in 1954. Other Hansa members included Allan Kaprow, Jane Wilson, and Wolf Kahn. During the 1950s, the Lansners began to spend summers on the eastern end of Long Island, which had become the summer nexus of the New York Art World. In 1971 they purchased a farmhouse in Bridgehampton, where Fay established another studio. Lansner exhibited extensively, made many lifelong friends in the Hampton’s and frequently hosted art world neighbors such as Larry Rivers, Perle Fine, Audrey Flack, and critic Harold Rosenberg. In her later years, Lansner continued to work in her studio on Broadway and 10th Street and at her home in New York City. She is widely represented in private, public, and corporate permanent collections including, the Corcoran Museum in Washington, D.C, Guild Hall in East Hampton, New York, the Metropolitan Museum of Art, New York University Art Collection, and the Philadelphia Museum. Fay Lansner (1921 – 2010) was an American painter known for her abstract expressionist and figurative paintings and her strong use of color. Lansner’s work evolved from her geometric abstract pastel and charcoal drawings of the late 1940’s when she was a student of Hans Hoffman, through a series of expressionist figurative paintings in the 1950’s and 1960’s, to her large bold portraits and still-life drawings in the 1990’s. Her work was the subject of thirty solo shows from 1951-2009, and she was included in over one hundred group exhibitions in the United States and Paris throughout her career. Lansner was born in Philadelphia, the daughter of Russian émigré parents. In 1945, she attended The Tyler School of Fine Arts at Temple University, but longing to be part of the “real” art world, she moved to New York City in 1947 to attend Columbia University and the Arts Students League. At Columbia, she studied with the illustrious art theorist Susanne Langer, who shared ground-breaking work on symbolism with her students, and at the Arts Students League she studied drawing with Vaclav Vytlacil. She also attended Hans Hofmann’s popular drawing class in Provincetown, Massachusetts in the summer of 1948 and continued to study with him in 1949 in New York City with fellow students Jan Muller, Wolf Kahn, Larry Rivers, and Grace Hartigan. During these early years, Fay married Kermit Lansner, and in 1950, the two moved to Paris, where Kermit had received a Fulbright Fellowship to study the philosopher Merleau-Ponty, while Fay embraced the chance to see the origins of modernism first hand. While living in Paris, she studied with Fernand Leger and then with Andre Lhote, and had her first solo exhibition of monochromatic lithographs at the Galerie Huit. 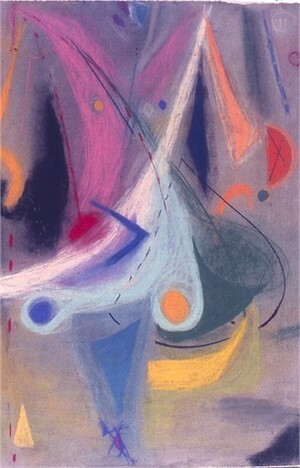 Upon her return to New York in 1951, Lansner was thrust into the Abstract Expressionist movement. Armed with her exposure to European art history and Hofmann’s lessons, she quickly became affiliated with her American peers, including Willem de Kooning, Joan Mitchell, and Franz Kline. She was briefly a member of the Artist’s Club but felt relegated by the founding male members. Soon she joined the Hansa Gallery, one of the first cooperative galleries that had begun to proliferate in downtown New York, and had her first American exhibition in 1954. Other Hansa members included Allan Kaprow, Jane Wilson, and Wolf Kahn. During the 1950s, the Lansners began to spend summers on the eastern end of Long Island, which had become the summer nexus of the New York Art World. In 1971 they purchased a farmhouse in Bridgehampton, where Fay established another studio. Lansner exhibited extensively, made many lifelong friends in the Hampton’s and frequently hosted art world neighbors such as Larry Rivers, Perle Fine, Audrey Flack, and critic Harold Rosenberg. While Lansner was a devoted admirer of abstraction and its tenants as laid down by Hans Hoffman, she knew early on that she wanted to concentrate on the figure. Lansner wanted to do a “Twentieth Century” figure. She set out to develop the language of the body as she could interpret it in twentieth century terms. 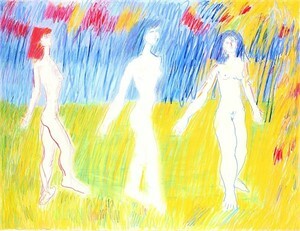 Lansner stated in a 1976 interview, “ I draw from the model [the figure], and also I don’t draw from the model. I draw from my imagination, from my feeling, from my idea, from sensation, and from the object. Nature. It’s very important to have some sort of model, a reference one can spring to and from.” In her later years, Lansner continued to work in her studio on Broadway and 10th Street and at her home in New York City. She is widely represented in private, public, and corporate permanent collections including, the Corcoran Museum in Washington, D.C, Guild Hall in East Hampton, New York, the Metropolitan Museum of Art, New York University Art Collection, and the Philadelphia Museum.